A man boasts that he visited the same pub and drank thousands of gallons of beer for the past 72 years. 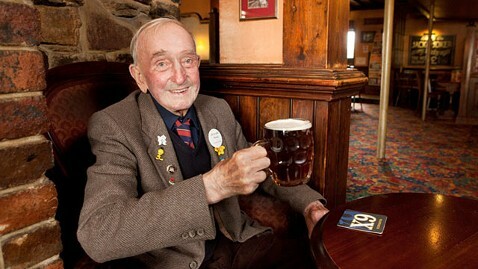 90-year-old Arthur Reid of Britain said his secret to a long life was drinking lots of beer. The retired worker and bachelor has consumed about 30,000 liters of beer by visiting the same pub in his local neighborhood almost every day for the last 72 years. "I've always worked hard and enjoyed visiting the pub," he told his local newspaper. "I've never seen the need to go much further." Reid has never traveled, he has gone beyond the small village of Warmley, in South Gloucestershire, England, near Bristol, where he was born and raised. He began making the trek from his home to a local pub, The Griffin, when he was just 18 years old, when his favorite drink cost much less than today. The staff of The Griffin waits for him at 3:00 pm every day and calls their loyal customer, "Uncle Art", as he is known by the family. They also say that he is one of the best people they have ever known, according to news media reports. Reid’s goodness and loyalty to the pub over the years has been rewarded with a special glass of his own behind the bar and now with a gold plaque on his favorite chair. The plate came courtesy of his younger sister, 65-year-old Margaret Lee Sze-Tsiok for his 90th birthday celebration. The plaque reads: "Arthur & his chair @ The Griffin. 90 years and still going," followed by the date "9/10/22" on the occasion of the first visit that sparked a lifelong habit. "I've been coming here for a long time and hopefully I can continue for some years to come," Reid told the news media.